The latest round of axe swinging is complete and this time it is the Serta/Simmons Bedding (SSB), work force that are the victims. My understanding is that close to 100 employees were given their notice as the executive team tries to figure out how to streamline their business and improve those bottom line results. SSB has a little different situation than Tempur/Sealy from where I sit. With Tempur Sealy you have a very strategic portfolio of brands. Tempur-Pedic with the strongest specialty sleep line in the industry. Sealy with a good brand and product line that can take you from velocity price points into the lower upper end, and the Stearns and Foster line that positions them well in the luxury category. With SSB on the other hand you have two companies with a very similar product strategy where they essentially compete in every category. Managing brands is difficult for even the most skilled marketing people, so consolidating these two groups and asking the sales force to navigate that effectively is going to be tricky. When a rep is trying to figure out which brand gets placed at a $999 price point and both groups have strong hybrid offerings, who gets the nod? I know that each situation is different, but I worked for a company that did this 20 something years ago and I’m telling you, its not as easy as it sounds. Anyone remember “Share The Vision”? We have two industry outsiders that will be running these companies in 2016 with Michael Traub for SSB and Scott Thompson for Tempur/Sealy. I posted a blog about the challenges outsiders face when coming in to the mattress industry which you can read HERE. Traub and I later laughed about this as he gave me a hard time about my comments. I reminded him however that I didn’t say an outsider could not be successful, I said that many have tried and failed because they over simplify the business. For the HR people that had to carry out the downsizing, I feel for you because I know that isn’t easy to do. And for the people that got let go at both Tempur/Sealy and SSB over the last few months, my prayers go out for all of you and your families today but keep the faith because you are on your path, and something good can come out of this for you if you choose it. 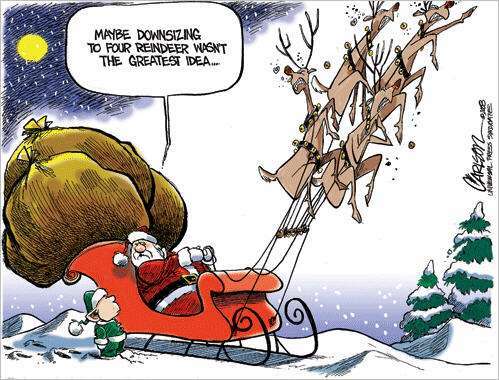 Well said and I love Santa’s troubles with downsizing. Leadership and management should not wait until the only tactic to increase profits is to down-size. As a 28 year veteran of the mattress business it is appalling how the race for profitability has cost good people their jobs, while the product quality suffers. Congratulations to the major bedding suppliers on creating a market where online start ups can use their old technology to beat them into submission…it is truly a shame how they continuously make the wrong decisions. Thanks for reading John and I agree it’s no fun watching these guys downsize. I will be speaking to this in more detail in next week’s post. Unfortunately it seems to be a race to the bottom…at the cost of good employees and consumers as the manufacturers de-spec their products.